➠Cut the crusts off the bread. Use a rolling pin to flatten the bread. Divide the ham or whatever filling you are using the bread and lay it out in a strip along the bottom edge of the bread. Cut to fit neatly if necessary. ➠Top each with 2 slices of cheese, or scatter grated cheese along the ham. Starting from the bottom, roll the bread up and finish with the seam side down. You can seal the seam with some egg to ensure it doesn't unroll. ➠Place the egg, milk, and salt in a flat dish and use a fork to whisk. Heat butter in a large fry pan over medium-high heat. Dip the roll-ups in the egg, rolling to coat all over. Then place in the frying pan. 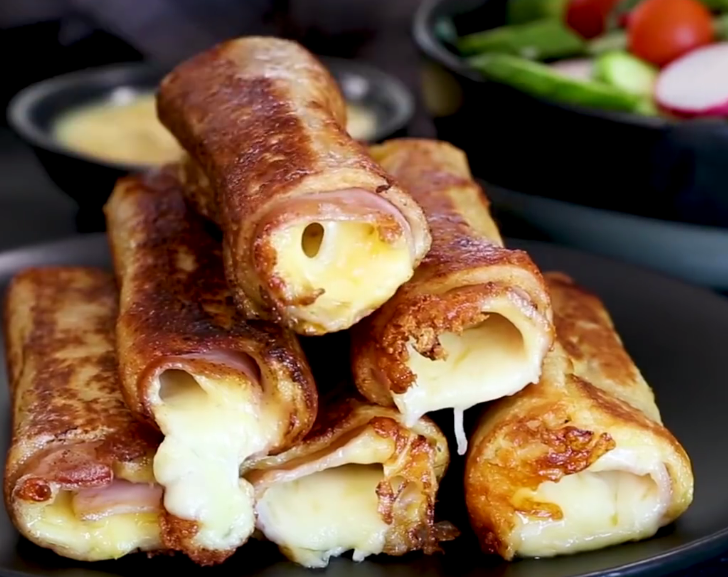 Place all roll-ups in the same pan. ➠Cook the roll-ups for 45 seconds to 1 minute, then turn 90 degrees. Repeat again 2 more times (so 4 sides of each roll-up are browned). Remove from pan and serve immediately.